The National Electric Code (NEC) is a set of safety and compliance standards for the electrical industry that's published by the National Fire Protection Association (NFPA). The American National Standards Institute (ANSI) recognizes the NEC as an American national standard for the electrical industry; therefore, it is formally identified as ANSI/NFPA 70. Whether you're installing a new ceiling light with a wall switch or roughing out a brand new addition with outlets, there is a right way and a wrong way to do the job. The NEC is designed and published to provide users with the answers to questions that are a matter of safety. Before you attempt to do electrical work at home, referring to the NEC can give a better understanding of what can and can't be done in relation to residential jobs. How many lights can be on a single circuit? How many outlets can be on a single circuit? How far away from a sink or bathtub should a GFCI outlet be? How far away from an entryway should an outlet be installed? How far apart should outlets be placed? How high up on a wall should the switch be installed? How many cables are safe to run through a length of half-inch conduit? What gauge of wire is required for a 30-Amp breaker? You will find the answers to all of these questions and more in The NEC. If you aren't familiar with the codebook, one of the biggest obstacles you may have is finding the article that provides the answer you're looking for. Each code in the NEC is assigned a number and broken down into parts, sections and fine print notes. For example, 802.22(B)(3)(c) is an article that's found in Chapter Eight and can be read as "Section 802, point 22(B)(3)(c)." Each chapter's articles are numbered accordingly, so articles in Chapter Three would be numbered in the three-hundreds. In the United States, anyone that negligently does something that results in the loss of life or damage to a property can be at risk of legal liability. Failure to comply with NEC guidelines could place you at risk of being found negligent in the injury, death or property damage. Negligence can also be placed on the city for providing permits for a job that isn't performed according to code. The NEC is a single, standardized source for the safe installation of electrical systems in the U.S. It does not include regional-specific rules and regulations that are often placed by many jurisdictions. Please note that jurisdictions can make amendments to the NEC for their specific area and that the rules and safety regulations set in place by the jurisdiction supersede those included in the NEC. Typically, jurisdiction amendments are stricter variations of NEC safety codes. 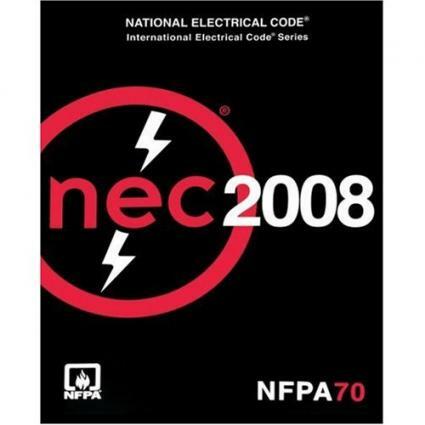 You can purchase the NFPA 70: National Electric Code as a bound book or find it for free as a restricted, digitized model through the NFPA website, with registration required. Many public libraries keep the latest copy on hand for reference use as well. Only versions of the NEC that have been accepted as law are available for free to the public. In the United States, most jurisdictions allow homeowners to perform their own electrical work. To do so, get a permit from your municipality and adhere to the NEC standards and jurisdictional amendments. An inspection of the work by a licensed electrical inspector will be required to ensure National Electric Code standards were followed. It should go without saying that if you are not fully comfortable with performing electrical work, a licensed electrician should be hired to do the job.